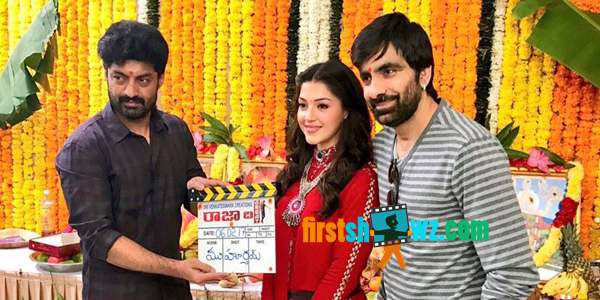 Actor Ravi Teja’s new movie Raja The Great has been launched today in Hyderabad with a formal pooja ceremony. Nandamuri Kalyanram who was the guest for the event has sounded the clap board for the muhurat shot. The first shot of the film was taken on lead actors of the film Mass Maharaja and young beauty Mehreen. Anil Ravipudi of Pataas fame is donning director cap for Raja The Great to be produced by Dil Raju under Sri Venkateswara Creations banner. Sai Kartheek is the music composer. Ravi Teja will also shoot for Vikram Sirikonda direction under Nallamalupu Bujji production with Lavanya Tripathi and Raashi Khanna as heroines. Pritam is music director.